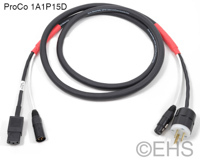 This is our custom-built AC Audio cable with 14 awg power and 1 channel of Audio, DMX, or AES digital audio. Construction is top quality Leviton, Union Connector, Neutrik, Rean, or Bulgin connectors with ProCo Siamese Twins wire. This ProCo wire is very flexible, durable, heavy-weight cable. Select the connectors and lengths needed to create the cord you need. What it's connecting to or from, for example, "Dimmer 1" "Stage Left" etc. Photo 1 shows 6' cable with Edison 15A Male, IEC Female, Gold XLRs, and red shrink master. Photo 2 shows the detail of ends. Photo 3 shows the wire size.